PM: 3.6 miles and lifted- arms and back. AM: 3 miles, then a ton of walking around Boston. Training: As far as mileage, speed, and nutrition I was ready. I had very little marathon specific training, my weight was a little high (151), and almost zero tempo/speedy long run stuff at marathon pace. I've been training pretty specifically for 5ks, minus all of the mileage. Not ideal, but definitely the best I've done for a marathon. 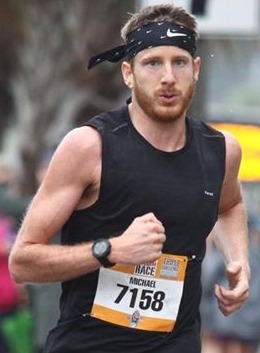 Goals: A goal- sub 2:40, B goal- sub 2:47 PR, C goal- Sub 3. The course: Everyone on this blog likely knows this course. very challenging course, downhill parts, uphill parts, headwinds, huge temperature/weather fluctuations. It is what it is. The support/crowds for this race are unprecedented which helps immensely. Weather: Started just like last year- humid, heavy rain, 45 degrees, steady winds with high gusts. I was soaking wet and cold before I even got on the bus, but I was smart this year and packed all my run clothes/shoes seperately/dry. Not making the same mistake as last year... The weather then, amazingly, got better from there- progressing evenly from 45 up to 65 degrees, still wicked humid, but the rain turned to mist then to clouds and then super sunny, and the wind (fortunately) was perpendicular the majority of the way. 1st 5k- This was the worst most annoying experience I've had in a race in a long time. I started way back in the corrals (was about 1,500-2,000th to cross the start line), respectively but figured everyone was fast so what's the big deal? Well, I ended up working incredibly hard trying to weave through people to be rewarded with a 6:40 "mile 1." It truly was like being in bumper-to-bumper traffic going 20 below the speed limit. I was a bit dejected, but knew I had work to do and needed to move up out of this mess of runners. I couldn't believe the difference 3 corrals made. We were stuck together almost at this pace, and I thought a 2:40 was pretty much out of the window even only a mile in. Eventually (mile 1.5) I found the edge that was full of puddles where the road (finally) opened a bit, and a bunch of runners and I made up a few hundred spots from there. This felt just like speeding in the breakdown lane, but it was envigorating. I made up a lot of ground here. 1st 5k was 18:55. 10k mark split- 18:41. I got into a groove here, now moving up towards front of the hoard. This is the easiest part of the course. 15k mark split- 18:48. Cruising. Also, I saw my family so I stopped and high-fived them all. 20k mark split- 18:47. Cruising for the most part. I had a ton of soreness, but it had been there since mile one, so I didn't pay it much attention as far as a derailer. Halfway totals- 1:19:01. This sections is my favorite. You have the Wellesley girls, and well... I mean you have the Wellesley girls... Also the town center is bumpin' so it's fun to high five and rile up the crowd. I saw my family for the second time here, and thanked them all again. 25k mark split- 18:23. A lot of runners began slowing during this 5k. I just kept cruising. I felt I had more in me, but knew how deceiving marathons could be, so I figured it wasn't worth it. I was content with 6 minute miles. 30k mark split- 18:44. Felt good- crowds helped. I moved up a couple of hundred people during this 5k. 35k mark split- 18:56. The Newton hills were mostly in this 5k, but they weren't bad. I got to see my family for the final time, and I was in great spirits. Riled up the crowd again, which is always fun. Kept moving up in place. 40k mark split- 18:32. Brookline/Boston. I LOVE this section. The crowds are unreal, and I love grabbing a beer from the crowd. You can feel the end of the race coming, but to be honest I could run this section infinite times and I do not believe it would get old. My first hamstring misfires began here, but I knew I'd be fine being so close to the finish. They take a couple of miles to onset fully. Finish 2.2 k. Final mile was a 5:42 or so. I didn't feel like I was moving that quickly, but I was still passing people. There is that one final dip/hill in this section under Mass Avenue which is a pain. The crowds are so dense that you kind of feel bad for not gunning it at this point, but any hills at this point are tough. I ran this entired section with a pretty big smile on my face. You feel like a movie star with all of the people watching! Final thoughts- I know this course isn't about running a specific time and isn't the kind of course you "pace", but I am happy with both of those aspects. Running a negative split really helped me mentally. I also finally put to rest my PR from 2015 by over 10 minutes, and definitely see a ton of room for growth if I want to stick with marathons. AM: 2 miles easy, then flew to Boston. BOSTON. Let's go!